The history of British painting is intimately linked with the broader traditions of European painting. Kings and queens commissioned portraits from German, Dutch, and Flemish artists. Holbein, Van Dyck, and other eminent foreign portraitists imparted an aura of grandeur to even their most unimposing sitters. During the 18th and 19th centuries, young members of the British upper classes broadened their education with the Grand Tour of continental Europe. They encountered a sophisticated level of artistic achievement that influenced their tastes as art patrons. To ensure similarly high standards in Britain, the Royal Academy was founded in London in 1769. Its first president was Sir Joshua Reynolds, a brilliant painter of lively and elegant portraits as well as an influential lecturer/author whose Discourses authoritatively addressed many aesthetic topics—including the preeminence of history painting. Royal Academicians and American ex-patriots Benjamin West and John Singleton Copley became celebrated as memorializers of the recent past. John Martin, around the same time, created dramatic, multifigured, biblical panoramas. The late 18th century saw a growing interest in landscape painting. Some artists, such as Richard Wilson, painted idealized scenes imbued with the spirit of the classical past, while others, such as Joseph Wright of Derby, pursued more individual and personal visions of the natural world. Thomas Gainsborough, although best known for his fashionable portraits, painted highly imaginative landscapes and seascapes that transcend specific time and place. The great flowering of English landscape paintings came during the first half of the 19th century, primarily in the work of two masters, John Constable and J.M.W. Turner. 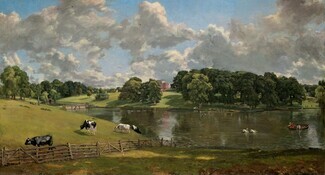 Constable’s true-to-life views of the verdant English countryside emphasized the essential harmony and purity of nature. Turner, on the other hand, was a romantic who expressively dissolved forms in terms of light and atmosphere. With their fresh vision and powerfully original styles, Constable and Turner profoundly influenced the work not only of many subsequent British painters but of countless other American and European artists as well.